On August 9, 2018, the handle @AKAQLazzarus appeared on Twitter, with the display name “Diane Luckey”, and a bio that read: “57 years young. I sang a few songs in the 80/90s”. Most people wouldn’t have noticed, and many wouldn’t have cared – but to a faction of passionate fans, the ripple effect of this appearance was momentous. Around 30 years ago, Q Lazzarus were a band making local rounds in New York City, before a chance encounter with director Jonathan Demme propelled them into the spotlight. Sometime in the first half of the 1980s, Demme was picked up by Q, the band’s captivating lead singer, while she was moonlighting as a cab driver in New York City. Sensing that Demme was in showbiz, she offered to play him some of her demos. One of them was “Goodbye Horses”, written by the late songwriter William Garvey, and performed by Q. It’s just one of those songs, a haunting, driving, synth-pop ballad, that’s unforgettable because of Q: her androgynous vocal soars over murky pads, picked guitar, and a pounding snare. Demme fell in love with the song immediately, and used it in his 1988 film Married To The Mob, reviving it later with his 1991 serial killer hit Silence Of The Lambs. Since those early appearances, “Goodbye Horses” has shown up in everything from Clerks II to a Gucci campaign, but Q herself has eluded the spotlight. She vanished from the public eye at some point in the mid-90s. What happened to the cult singer is the source of much debate and amateur online sleuthing – Reddit’s Unresolved Mysteries page features hundreds of comments from people trying to solve the “case”. When the @AKAQLazzarus account was created last year, the person behind it sent a tweet saying that they wanted to speak to Dazed. Thomas Gorton, then the site’s editor, had been looking for Diane Luckey (known as Q) for the best part of a year. In April 2018, he published a piece on Dazed titled “What happened To Q, who sang ‘Goodbye Horses’?”. For the Dazed article, Gorton and writer Charlie Graham-Dixon spoke to Q’s friends, record label, and band members, who all shared their own theories on her whereabouts today, but nobody had a definitive answer. Many – including YouTube comment sections and Reddit threads – thought she may have passed away. The appearance of a Twitter account acknowledging the existence of the Dazed article hinted that she may still be out there; as did a DM she sent to Gorton containing a phone number and address. “Hi, sorry to bother you. I just wanted people to know I am still alive, I have no interest in singing anymore. I am a bus driver in Staten Island (I have been for YEARS), I see hundreds of passengers everyday so I am hardly hiding (or dead! ), I have given Thomas Gorton (Dazed) my fone number and address just to confirm I am ‘real’, sorry if this is a boring end to the story, I am going to come off twitter soon as I find it odd, please take note of this message incase anyone else is interested. THANK YOU”. So, now both myself and Gorton had contact with someone claiming to be Q. But, in an age of catfishing and false online identities, there was still no way to be sure that this person was who they were purporting to be. It wouldn’t be hard for a prankster to take advantage of the interest in Q’s case within the Unsolved Mysteries community, using the information available to set up a fake account and dupe people. Dazed held off publishing any news until we had checked out the veracity of the Twitter account, but I did excitedly post a Facebook status about the discovery, which was then aggregated by American outlets such as Stereogum and Spin. These headlines asserted that Q was the person behind the Twitter account as a fact. Maybe she was, but we didn’t know that yet. Here’s where the story gets more complicated. The story about Q driving buses seemed to check out. According to the NY Post, in 2015, a Hasidic-owned bus company called Monsey Trails was sued by a Staten Island bus driver named Diane Luckey, who claimed that they refused to hire female drivers. The address also seemed legit. At the time of Q’s apparent reappearance, a filmmaker named Sean Gallagher contacted me to say that he’d been looking for Q for several months, and had also done his own research into a Diane Luckey who he suspected to be Q, in the form of tracing family obituaries from the rumoured hometown of the cult singer. We shared data we’d individually collected over a few days, even finding a defunct tour bus company that Q and her family had seemingly set up a few years ago; the reviews left on the company’s page seem to have been left by family members, who also lined up with those we found through a paid information download. The number given to Gorton by @AKAQLazzarus was also confirmed as being registered to a Diane Luckey, aged between 55 and 60, who lives in Staten Island, according to search engine nuwber.com. Gorton texted the number in a bid to arrange a call, and rang it a few times. With no luck, he contacted her on Twitter – she apologised for not answering, saying that she felt shy. However, when Gorton did eventually get through on the phone, the woman on the other end claimed to live in Queens, and to have never heard of Diane. Subsequent text correspondence on this number only proved a bigger brick wall, and the responses grew more and more emphatic – he was repeatedly told that this phone does not belong to Diane Luckey. So far, everything that @AKAQLazzarus had sent us was information that could be found publicly online, provided you were willing to dig for it. That is, everything except for the address she’d sent to Gorton. After speaking with Gorton, I decided to go to the address, which matched the records I’d compared with Gallagher. It was a decision we were anxious about, but we wagered that the person who sent us the messages volunteered the location, and had said that she wanted people to know that she’s alive and happy to not be making music anymore. 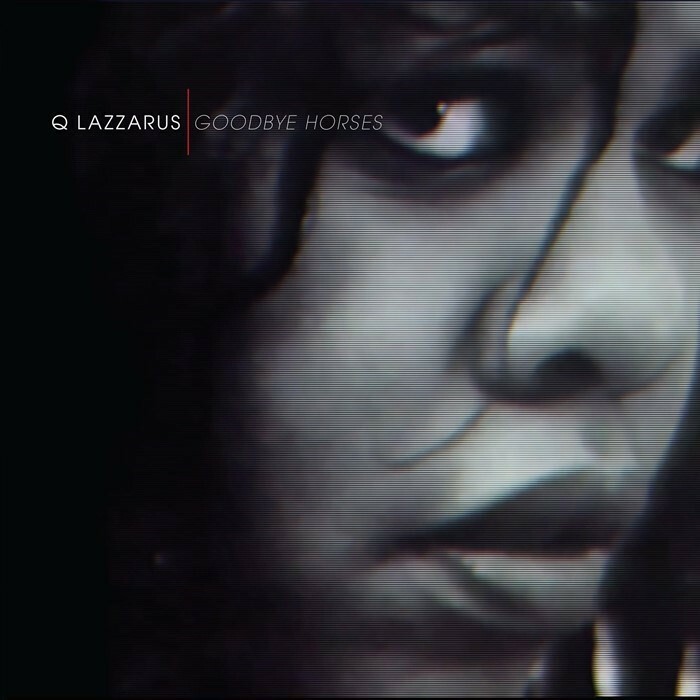 The address felt like our last hope to verify that this was, in fact, Q Lazzarus. On a Monday evening after work, I left my office in Brooklyn, and three trains, a ferry ride, and a long walk later, I found myself standing in a wine shop in Staten Island with the intention of bringing the woman a small token of appreciation if she decided to answer the door. I thought it would double as an apology, if I turned out to be some nagging stranger on the doorstep of someone who had no idea what the hell was happening. I walked up to the building bearing the address, and a young person cleaning out a car across the street asked if I was looking for someone. “Diane Luckey – you know her?” I replied. The person said that Ms. Luckey did in fact live there with her husband, and pointed to the entrance to her home. I knocked three times and waited. No answer, so I tried again – still nothing. The young person was still there, so I walked over to ask them some questions. They told me Ms. Luckey’s car was missing, so she was probably at work. I said I’d been sent there to try to confirm a story I was working on, and that Luckey had contacted me online, but left little proof that it was truly her. 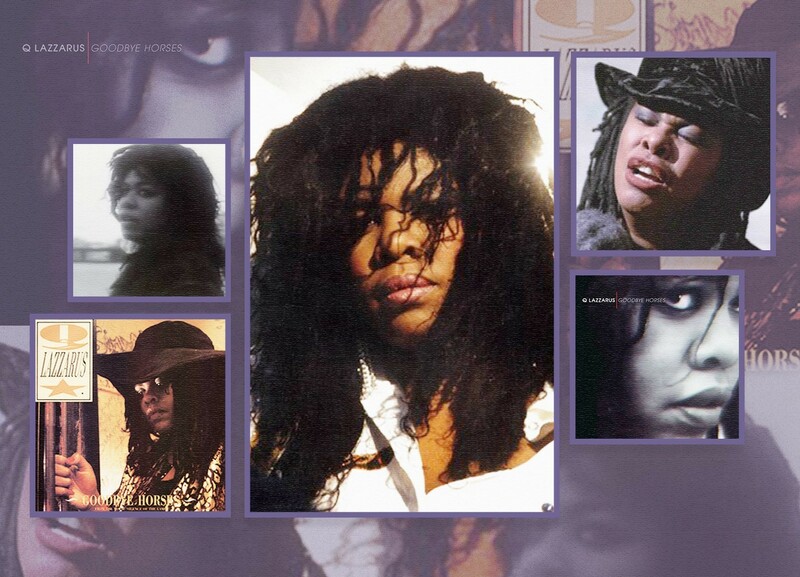 I pulled up the Q Lazzarus promo shots from the late 80s, and the young person hesitantly said that it could be her – but not with absolute certainty. At this point, another person showed up and asked what we were talking about, so their friend explained the situation. Noticing that they both seemed slightly unsure about saying anything too concrete, I took a half-hearted confirmation and left. Heading home, feeling dejected, I received a message from Gallagher asking me if I’d like to go back to the house, this time with him. His independent search for Q made him absolutely positive that we had the correct woman and address, and convincing myself the young person’s quasi-positive identification of the promo shots was something, I agreed. The following day, I once again made the long trip to Staten Island. A vehicle was parked in the empty spot in front of the home, so someone had to be home this time. When we knocked, a man with a long grey ponytail answered the door, appearing slightly irritated, but not entirely confused as to why we’d shown up at his home. I explained to the man that an editor in London had sent me, after he’d received messages from a person that contained this address. Even if it wasn’t the real Q Lazzarus, I felt that the people who lived there should know someone was handing out their address to reporters who were hoping to find a singer who nobody had heard from since 1996. The man denied that anyone living in the house had sent the messages, adding, “Luckey is a pretty common name, I guess.” I went straight to the point: “So the woman who lives here wasn’t a singer in the late 1980s?” The man stood his ground. “Not that I know of,” he said. We left, thanked the man for his time, and wished him well. At this point, I believed that we’d been scammed. This story had proven itself huge in such a short amount of time – the attention continued to grow, with a YouTube video on the story garnering thousands of views – and I could hardly open Facebook without three new message requests asking if I had any further information I’d be willing to share. Reddit continued to buzz. Gallagher and I stopped at a local bar near the house and ordered a commiseration drink. We went back and forth: Was Q sequestering herself from the invasive questions of journalists? Or was it all a lie? The only conclusion we could draw was that if the Twitter account was real, the singer had sent those DMs in a simple attempt to get an “I’m alive!” message out into the world. When I’d requested an interview with Luckey in our initial conversation, I’d been met with a swift “don’t want to speak to anyone unless 100 per cent necessary, I’m not hard to find”. Gallagher and I went our separate ways, but promised to stay on the hunt should anything else come up. Over the next few weeks, I stayed busy with a new job and went on tour with my band, all the time wishing there was any way I could prove beyond a shadow of a doubt that Q Lazzarus was alive and well and driving a bus in Staten Island. My gut told me it was her, and she just didn’t want to be hounded by the media, so I refrained from sending her any letters, or trying to return to the home again. Some more messages came in on Facebook, from people telling me they’d become enthralled with the story and wanted to know if I’d been able to gather any more info. I was even contacted by a promoter in Texas, asking if I could help him book Q to fly down and sing at his venue, which helped me understand more deeply why she chose to hightail it out of the vulture-ridden music industry. I’d all but given up when a man in Cornwall, England named Simon Duffield reached out with a kind message telling me he found my “Q Lazzarus investigation fascinating!” He went on to say he had a potential lead for me, a link to the social media page of one of Luckey’s family members. (Duffield had found the person’s profile through the failed bus company endeavour listing Diane Luckey as the manager.) I agreed to check it out, and he sent over the link to their page. I sent them a friend request with no hopes of them responding to me, a random stranger. Now we had a picture of someone who looked identical to the Q Lazzarus we’d seen on album covers, but still we felt that we needed further clarification. Dazed got in touch with facial recognition experts at Greenwich University known as Super Recognisers, people who “have an above average ability to recognise faces. Typically, this is classified as being in the top 1-2% on a selection of face recognition tests.” Super Recognisers conduct tests to verify whether or not people are the same people, by analysing a sample of images. We sent them a selection of photos – what few photos there were of Q from the 80s, and the ones I’d found on Facebook. The result came back positive, stating that there is “a high degree of probability that the person featured in all the images is the same person”. This, for us, is where the story should conclude. After two decades in the shadows, it appears that Q may have reached out to us to send a signal to fans and amateur sleuths across the world that she’s alive. But if it is really her, as the Super Recognisers say, then she has also made it abundantly clear that she doesn’t wish to share any more than that. We might feel a compulsive need to “solve” the “mystery”, and it might be hard for people to accept that there are still so many question marks hanging over the story of Q: why the “Goodbye Horses” royalties have remained unclaimed for years, why the singer stayed quiet for so long, why she left the music industry, why she doesn’t want attention today. What might be even harder to accept is that these reasons may stay unknown forever. Q alone knows the answers. Maybe one day she will decide to give an interview and reveal everything – or, maybe, she won’t.